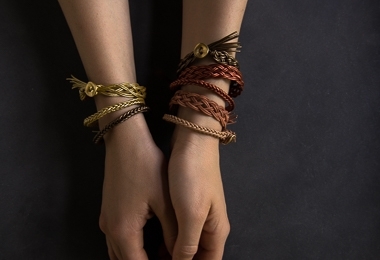 Our Braided Leather Bracelets take friendship bracelets to the next level! Their basic braiding techniques may be as easy as any summer camp craft, but these Bracelets are a far cry from any gimp lanyard. They’re fresh and simple, chic and sophisticated, super pretty and definitely special. Our Braided Leather Bracelet Pattern is appropriate for kids and adults and includes thorough instructions for two different braid patterns. Available for individual purchase as a PDF download, for a list of materials you'll need to make your own Bracelets, please click Product Details, above. Two 1/2-inch buttons. We used Purl Soho's Petal Buttons, 1/2 inch. 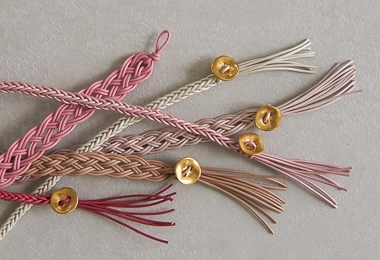 Another option: These materials, including the Pattern, come in our Braided Leather Bracelet Kit.